Through the generosity of alumni, faculty, and friends, over $1,000,000 in merit and need-based scholarship support has been awarded to Lubar School of Business students in 2018-19. 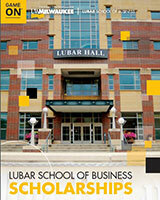 You must be admitted to UW-Milwaukee with an intended undergraduate major in Business or be admitted to a Lubar graduate program in order to apply for these scholarships. New Freshmen: Incoming admitted first-year undergraduate students may be eligible for scholarships (merit or merit+need-based). Eligible students will be contacted based on their admission data. New Graduate Students: Incoming admitted graduate students will be contacted by email prior to their first semester with application information prior to their first semester. Continuing & Transfer Students: Continuing and transfer students will receive an email to their UWM email account in March or April that announces the online application process for awards for the following academic year. I would have never known what it was like to be a UWM Panther. Proud of my university and in love with the city of Milwaukee. Please visit Financial Aid for more information, and view the UWM Panther Scholarship Portal.